Collaboration is a key component of successful community interventions. 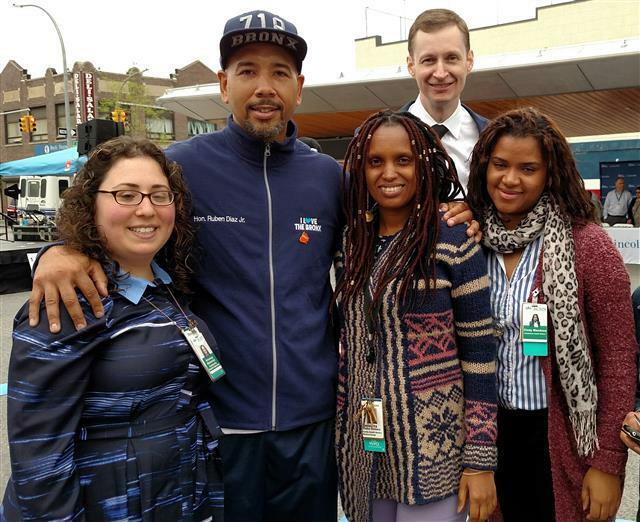 We at BCHN were proud to partner with the Office of Bronx Borough President, Ruben Diaz Jr., and a number of Bronx organizations, in hosting health and wellness activities during Health Day at the newly renovated Fordham Plaza on May 13. Learn more about this event, and other activities, in our May newsletter below. 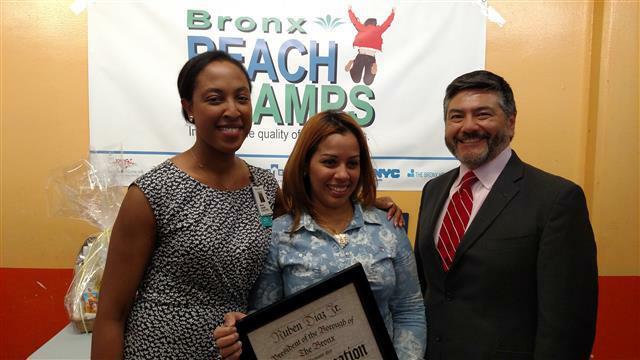 The first year successes of the Bronx REACH CHAMPS initiative were highlighted in a New York Daily News article that ran online and in print on May 5. Read the story here. Two local stores—Gold Grill Deli Grocery and Vivian Grocery—received proclamations from the Bronx Borough President's Office after completing required steps in the Montefiore Healthy Store Initiative, a collaboration with Bronx REACH CHAMPS and the NYC Department of Health's Shop Healthy NYC Program. Patricia Tejada, the owner of Gold Grill Deli Grocery, shared her excitement with the attendees while receiving the special recognition. "I'm so excited I can help people get healthy food," she said. News 12 was on hand to cover the event. Watch Reena Roy's feature here. Bronx REACH CHAMPS partnered with the Bronx Borough President's Office on a Worksite Wellness event outside Fordham Plaza on Friday, May 13, as part of #Not 62 Health Day during the annual Bronx Week celebration. BCHN team members distributed a Worksite Wellness packet, which included information about creating a healthier workplace, healthy recipes and maps of nearby walking paths. Local organizations and businesses signed up for a free workshop to learn more about the program. In addition to yoga, Zumba, tai chi, wall climbing and other activities taking place during the day, Bronx REACH CHAMPS offered attendees healthy eating tips for the work day from Chef Geneva Wilson, and a simple exercise routine you can do at the office by N'Namdi Nelson. Bronx Borough President Ruben Diaz Jr. with the team from BCHN at Health Day on May 13. WPIX was among the many media outlets covering the event. Watch their segments here, including an interview with Chef Wilson. Bronx REACH CHAMPS also asked community members what they did to stay healthy during the work day. Find out what attendees had to say in the video below. On Wednesday, May 18, Bronx REACH CHAMPS brought together 30 people from 14 organizations at a community engagement meeting hosted at Bronx Community Health Network. The meeting included presentations from BCHN and New Yorkers for Parks, and an update from the Montefiore Office of Community & Population Health. 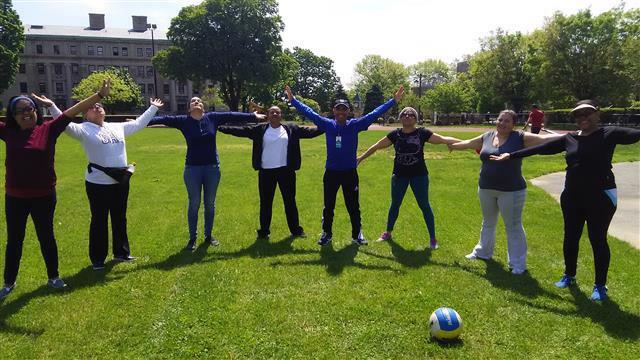 The goal of the Bronx REACH CHAMPS program is to increase access to physical activity in local parks. 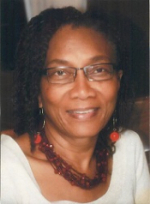 To find out more about our parks and open spaces initiative, contact Paulette Spencer at pspencer@bchnhealth.org. 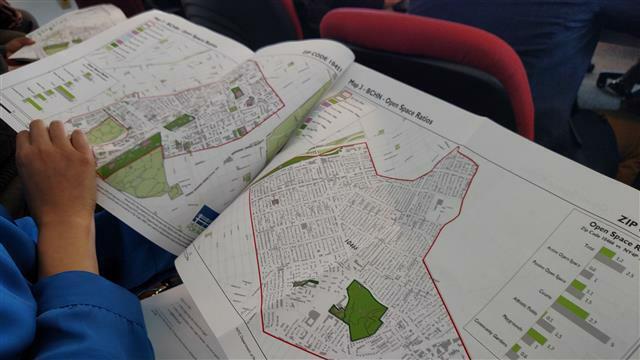 New Yorkers for Parks presented findings from their report on local parks and open spaces during a community engagement meeting hosted by BCHN on May 18. This month we shine the spotlight on Haffen Park, located at Hammersley Ave. to Burke Ave. bet. Ely Ave. and Gunther Ave. 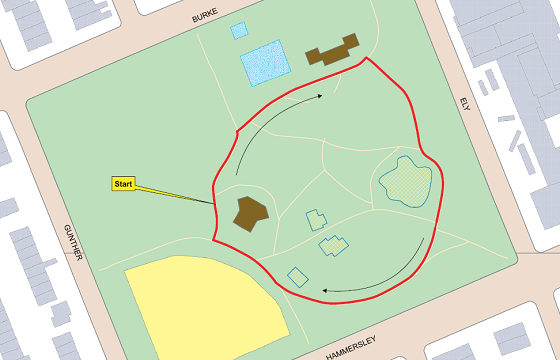 The walking path inside the park (see below) is 465 yards, and it takes approximately 3.75 laps to 1 mile. BCHN's Pedro Gonzales and the walking group at University Avenue Family Practice. The walking club at BCHN sponsored health center University Avenue Family Practice recently kicked off its second year led by community health worker Pedro Gonzalez. The primary focus is working with prediabetes patients on losing weight and lowering blood sugar levels. Every week individual weights are measured and recorded for the participants, which includes people of all ages, ranging from young adults to seniors. Presently, the group walks from University Avenue Family Practice to the track and field at Bronx Community College. Chef Wilson giving a healthy cooking demonstration at P.S. 28 on May 18. 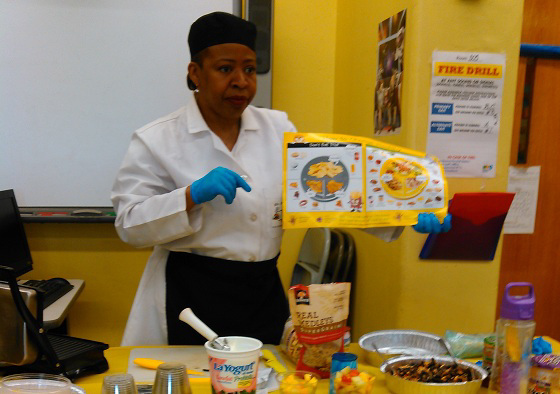 On May 18, BCHN consultant Chef Wilson led a healthy cooking workshop at P.S. 28 for parents and staff members. The event included a demonstration of simple healthy recipes, stressed the importance of portion size, and offered tips on healthier beverage options such as drinking fruit-infused water instead of juice or sugar-sweetened beverages. The Health Resources and Services Administration (HRSA) visited BCHN on May 5-6 to review the CICERO Program, the Ryan White HIV program of the Montefiore Medical Group and the Bronx Community Health Network. HRSA returned on May 16-18 to review the Bronx Healthy Start Partnership, which serves pregnant and new mothers and fathers to help reduce preterm births, low birth weight, maternal complications and maternal and infant mortality. * On May 5, members of the BCHN community health team faciliated a breast health workshop at SUNY North Bronx Center. * Also on May 5, BCHN community health workers led a "Salt Matters" demonstration during the health fair at International Leadership Charter High School. During the activity, students guessed sodium/salt content levels of numerous food items, and learned the importance of limiting salt consumption. On May 7, BCHN community health workers promoted children's health at Belmont Community Day Care Center’s 6th Annual Day of the Young Child. On May 11, a tream of BCHN community health workers promoted health and wellness at the M.S. 45 health fair. On May 14, BCHN community health worker Pedro R. Gonzalez facilitated a Healthy Heart Healthy Brain workshop at High Bridge Community Church. He also took blood pressure measurements for attendees. 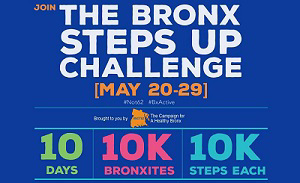 BCHN is a partner organization in the #Not62 Campaign, and we are challenging Bronxites to participate in the American Public Health Association's (APHA) 1 Billion Steps Challenge. The #Not62 Campaign—an initative led by Borough President Ruben Diaz Jr. to improve the Bronx's 62nd ranking out of 62 New York counties—is challenging all Bronxites to join the effort. Find out more here. BCHN will be celebrating the accomplishments of 2015 and conducting an oral health symposium at the organization's annual meeting. This year's theme is "Healthy Living / Smiles" and will feature a panel discussion on "Collaboration and Integration of Primary and Oral Health Care" moderated by Jay Izes, MD. Panelists include Peter Belamarich, M.D., Noel Brown, M.D., Sharon Distant-Johnson, M.D., and Julie Kazimiroff, D.D.S. Bronx REACH CHAMPS will be hosting a grocery store recognition ceremony for Compare Foods with our partner NYC Health + Hospitals, Gotham Health-Segundo Ruiz Belvis. The store owner will receive a proclamation from the Borough President's Office, and walking tours will be provided.